The first lunar landing, Apollo 11, framed with the American flag. In this historical photo from the U.S. space agency, the American flag heralds the flight of Apollo 11, the first lunar landing mission. 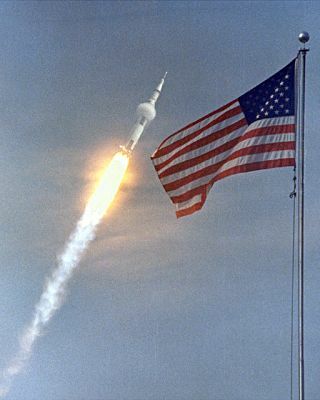 The Apollo 11 Saturn V space vehicle lifted off with astronauts Neil A. Armstrong, Michael Collins and Edwin E. Aldrin, Jr., at 9:32 a.m. EDT July 16, 1969, from Kennedy Space Center's Launch Complex 39A. During the eight-day mission, Armstrong and Aldrin descended in a lunar module to the moon's surface on Mare Tranquillitatis, or the Sea of Tranquility, while Collins orbits overhead in the Command Module.